I was baptized 30 years ago on this day. 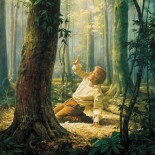 It is therefore with bittersweet feelings that I say I will—for the foreseeable future—not be attending Mormon church or engaging in Mormon activism (with the exception of the upcoming Ordain Women priesthood session event). But being part of an organization that rejects who I am at a fundamental level has exacted a price. Right now, it hurts too much for me to continue. I have met so many wonderful Mormon folk in these past few years. No one was ever unkind to me. (The membership is, in this respect, much more open and accepting than the leadership.) The church is slowly changing, and someday I may feel called to return again. For now, I bid a fond farewell and I look forward to the next chapter in my spiritual life. To those LGBT, feminist, and allied Mormons who stay and continue the work of Christ’s love in the church: you are in my heart, as I have been in yours. Good luck to you. I really enjoyed reading your views of the Gospel! This entry was posted on March 3, 2014 by EdwardJ and tagged LGBT, Mormon church, Women priesthood.